You bought the Psychofluid2 CD ? You can access some Bonus tracks and goodies on this page. - You will receive an email to confirm your email adress. - You must click on the link in this email to activate your account. - Then, you can login using your email adress and the password from the Psychofluid2 CD Leaflet. 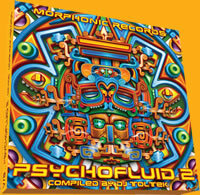 Please login below using your registered email and the password written on the CD Leaflet of Psychofluid2 compilation. Please enter your informations and press "Send" to register for the Members Area. The EMAIL must be PC or MAC email adress. Mobile Phone adress can be problem.